We believe it is important to record visual design decisions that a communication/information designer makes while designing. These decisions may come across as subjective to those not involved in the design process. This article hopes to illustrate that nothing is subjective or done for the personal liking of the designer while designing a form. Every single element in the form is positioned so with great care. It has a very strong rationale behind it. These details may help students of communication design understand the process of designing better. We hope you enjoy this article! Don't want to read in detail? Immunization card content: What is too much or too little? Red box refers to the card we have re-designed- the card currently used at PHCs in Maharashtra. Several types of healthcare units operate in India at varying scales and offer various services. We conducted contextual inquiries at different types of healthcare units to assess stakeholder needs. We also looked at several immunization cards from India and abroad. Leading to the question- how may we design an immunization card that responds to the Indian context? Let us now look at the various stakeholders involved in the immunization program. •	Fails to explain importance of vaccination as a whole and each immunization in particular to parents. To parents, vaccine names are mere jargon. •	It does not lend itself to speedy input and retrieval of data; while recording immunization details a nurse has to go against her direction of natural flow in writing. •	It does not accommodate cancellations and revision in the ‘date of next visit’ column. D] Type of clinic: Government funded multi-facility hospital and medical college. Facilities where vaccines available under UIP programme are given for free receive substantial to massive parent turnout during routine immunizations. The ratio of health care workers to number of children immunized is skewed hence giving personal attention to queries of each parent is very difficult. It was observed that often young and first-time mothers visit the hospital for vaccination of the baby, without having any detailed knowledge about vaccination and or its significance. Young mothers also showed less confidence in holding the baby, carrying it from one point to the other in the immunization process. Most women visit vaccination centre with a family member such as husband, mother-in-law, elder sister, for company. Even if a mothers holds the child while it receives immunization, the health-care workers prefer giving further instructions to the accompanying individual. Thus the mother isn't fully involved in the vaccination process. How to hold the baby- as depending on the site of immunization, the way the baby is to be held changes. What clothing is appropriate for baby depending on the season? Not to breast-feed the child for the next 10 minutes after polio drops had been administered. In their experience this had caused children to vomit. To press the cotton wad at the site of immunization and not to not let go of the baby for a while as the wound of immunization continues to bleed for a bit, if not pressed shut with a piece of cotton. After immunizations, the babies were likely to get fever and health-workers told each mother that she should give her child medicine for fever thrice a day. Parents were also encouraged to get rid of old stock of fever medicine at home and use fresh one. As fever medicine was not covered by immunization program (though it is one of the side-effects seen in some babies) parents were less likely to throw out dated medicines for fear of ‘wasting’ them. For each child Government provides 2 immunization cards. 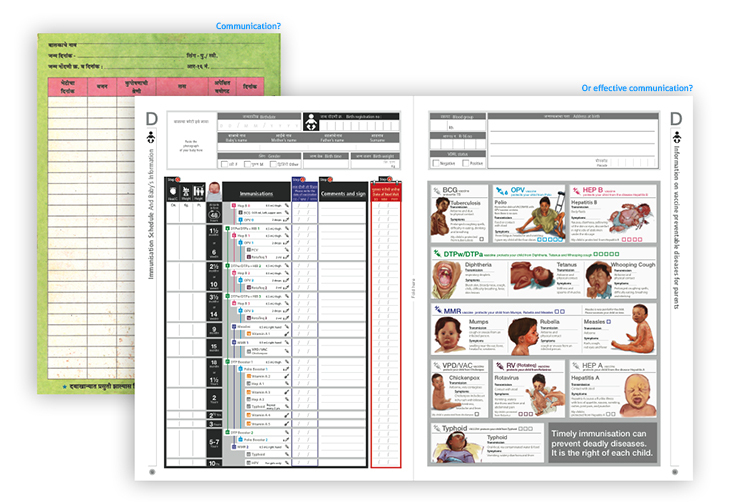 One card is a home-based immunization record carried by parents and another one is with the doctor for the clinic side record. At the government run primary healthcare centre, the procedure of immunizing the baby and entering relevant details in the immunization card takes about 10-15 minutes. Health-worker weighs the baby, may or may not make a note of baby’s malnourishment status onto the card. Later the card is checked for previous immunisation administered. Simultaneously the baby is examined for cold, fever etc and whether it is can receive immunization. Once the baby is found to be okay, the immunizations are administered. Health-workers note the date of current immunization as well as date of next visit onto the card and inform parents about the same. In certain clinics one person immunizes the baby while other person notes immunization data onto the home-based card as well as clinic side copy. In a high-volume clinic that is understaffed this strategy works. At times, due to miscalculation in date of next visit or some other error, the health-worker writes the wrong date and ends up canceling it. Current cards don’t have spaces designed to accommodate errors. Moreover due to the amount of crowd and in order to be quicker, in certain clinics the immunization card was filled only with most important details like date of vaccination and date of next visit. While others such as height and weight of the baby, status of malnourishment etc were considered a time-consuming additional burden and were altogether skipped. Thus cards tend to remain un-updated or not updated fully. (In other cases, parents forget cards or lose them.) Although there is a clinic side copy of the immunization data for each child receiving free immunization under UIP, all these entries are manually made into a register and this database being physical is not easily searchable. The hospital/ or clinic does provide parents with a new card, sometimes against a small monetary fine (in the trust funded hospital). But parents will be expected to recall the immunizations administered previously. 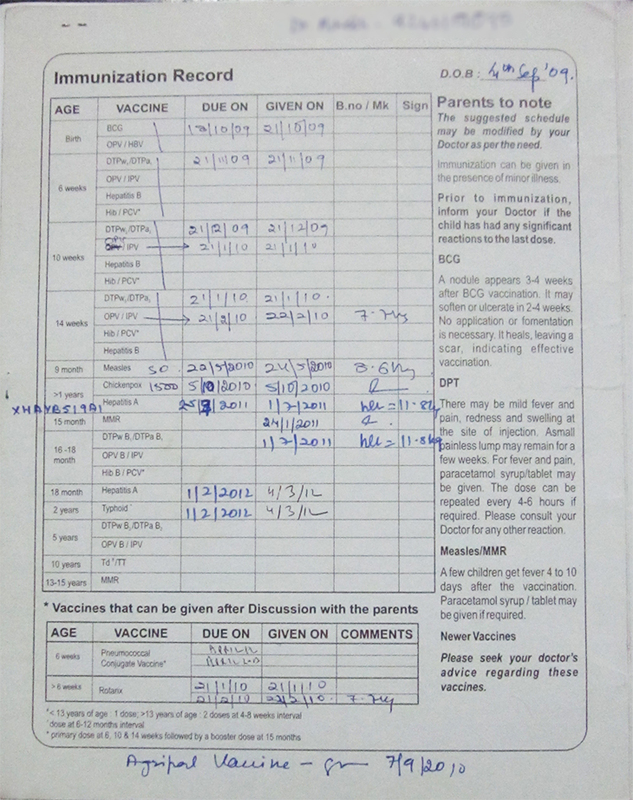 There is another scenario where children are brought for immunization by their relatives or neighbours while the immunization card is left at home, in such cases calling someone at home and asking them what the last immunization was may not always yield relevant and accurate information, as people across varying literacy levels may not be able to read or pronounce vaccine names. Some parents see the process of immunization as a burden as they have to take time out of their working schedules to go the PHC, children who seemed otherwise healthy and happy cry endlessly after receiving immunizations. They may also get fever and parents may not be able to spare time from their work hours to comfort their children. Currently multiple types of immunization cards are floating in India. Government issued immunization cards across states, Immunization card issued by Indian Academy of Pediatrics, immunization cards used in private hospitals and those sponsored by pharmaceutical companies. The cards in case of private hospitals doubled up as files to hold papers together. As they were made from thicker paper and laminated, they lasted substantially longer even after immunizations were completed. The private clinic issued immunization files are often sponsored by pharmaceuticals and perhaps that explains their better durability. On the other hand, BMC issues cards are made from non-laminated simple card paper and were non durable. During contextual inquiry at the primary healthcare centres, parents were seen bringing in torn cards or photocopies of the card as the earlier card had given away. Private clinic immunization cards included all vaccines recommended by the Indian Pediatric Association and not just those administered for free under government's Universal Immunization Programme (UIP). 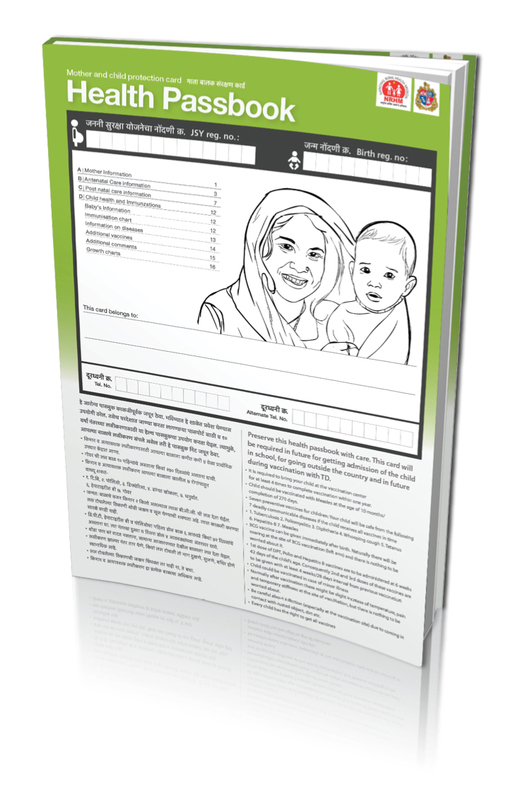 BMC immunization card does include instructions such as Hep B vaccine should be administered within 48 hours of child's birth and care to be taken in case of diarrhoea. However, information such as a nodule will appear on child's arm where BCG vaccine was given is not provided on the BMC immunization card. The nurse immunizing the child thus ends up giving this instruction repeatedly to parents of each child that comes in for immunization. Moreover at present neither the private clinic nor the BMC issued immunization cards currently give any information specific to the significance of each vaccine and the disease it prevents. 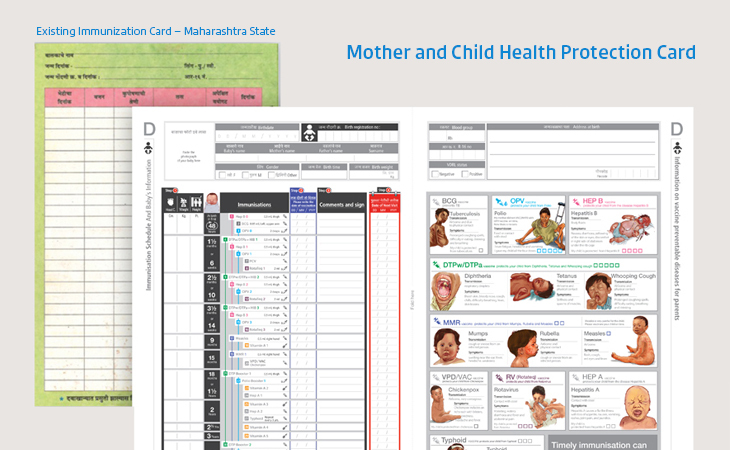 These cards also include growth charts (graphs that help visualize progress of baby's height, weight and head circumference) which were found to be absent in BMC issued immunization cards of Mumbai. 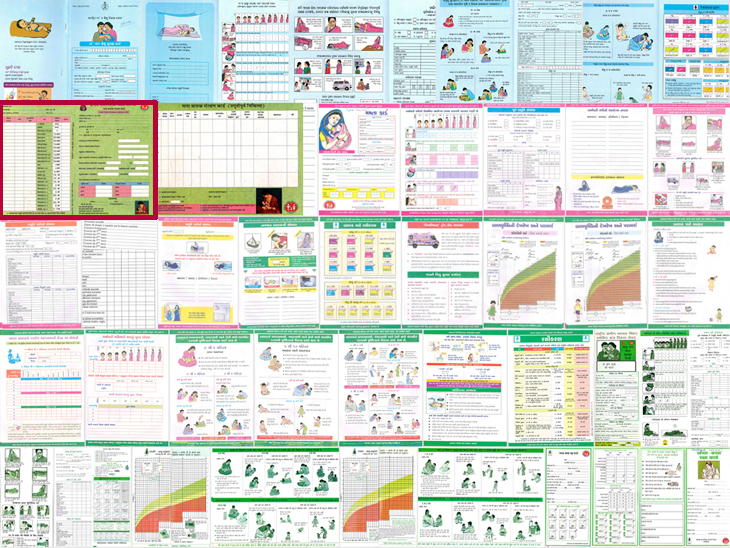 However, the government immunization cards developed in collaboration with UNICIEF and distributed in states like Bihar, Chhattisgarh etc do include growth charts. Private clinic cards also include age wise milestones of baby's development, which are absent in BMC immunization card. Ours is a Vaccination only chart. (2) Our prototype evolved in response to the insights obtained from need-finding exercises. It consists of mother’s and baby’s demographic information and a vaccine schedule. Further growth charts were added too. 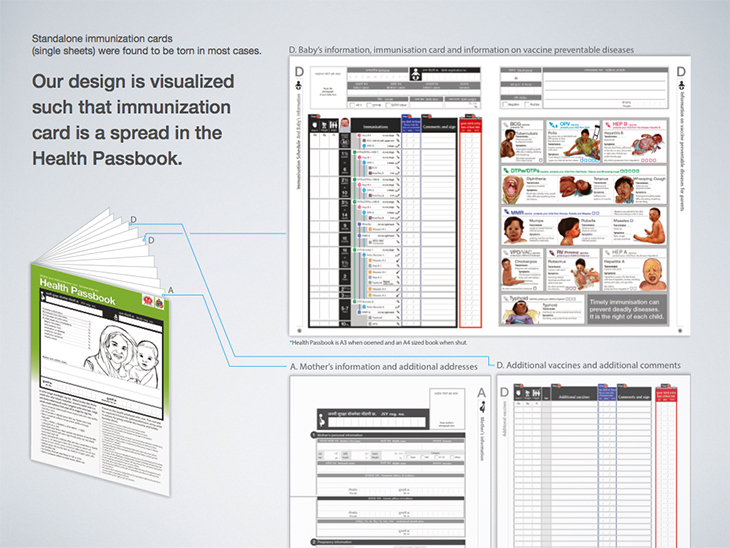 Redesign of the immunization card began with arranging and rearranging data. The header has been organised into a 4 step action-oriented wizard such that all the necessary steps are followed and no detail is missed. 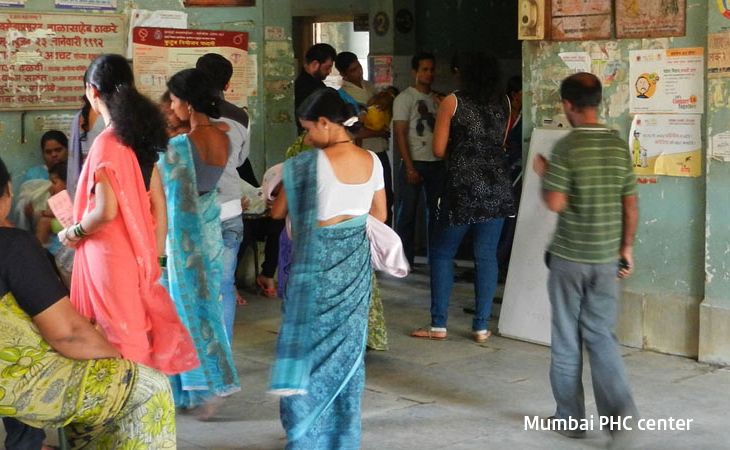 These four steps mimic the sequence of actions at an immunisation centre / PHC in India. 4: Write date of next visit. We came across a more or less standard immunization protocol at four types of clinics we studied. 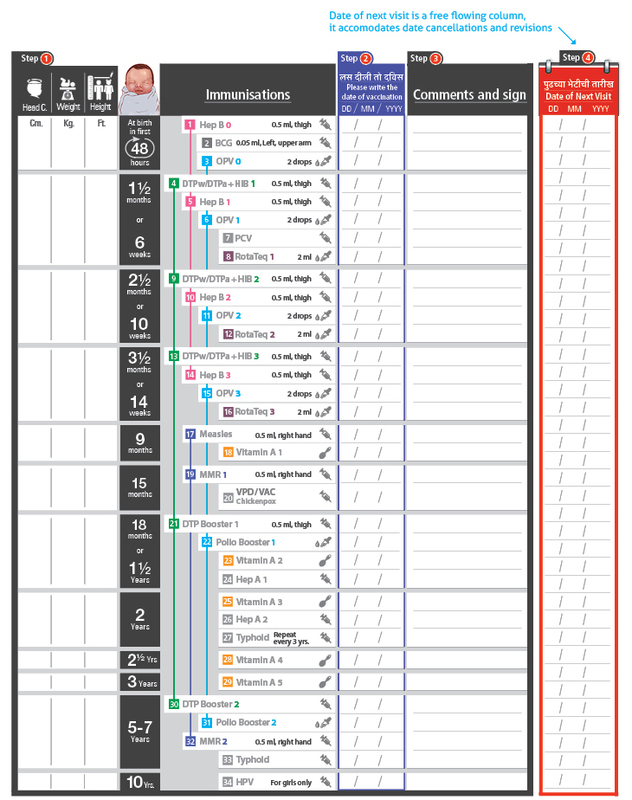 We arranged fields of the immunization schedule into a 4 step wizard around that protocol. To keep printing costs low or in case of photocopies being used when the printed forms don’t get supplied; we designed our form in Black/white. During contextual inquiry it was found that when columns of date of vaccination and date of next visit fell right next to each other and are not visually very distinct it created trouble for person entering as well as retrieving data from these columns. Thus it was clear that the two date columns have to be separated somehow. Thus dates of immunisation and next immunisation are separated by distance, differentiated by colour coding and change of heading. The heading, 'date of next immunisation' has been changed to date of next visit. (See top)A visual calendar element has been added to reinforce the message- here’s an important date to be remembered. Moreover the date of immunisation should be entered by the health worker/PHC staff only after vaccinating the child and hence it is positioned on the right of ‘list of vaccines’ column and before comments’ column. We wanted to be sure that we don’t interrupt the nurse’s flow of writing and hence date of next visit was brought to extreme right- as that is the last entry she makes before the card is handed back to the parents. However from parents’ point of view this is priority number one. 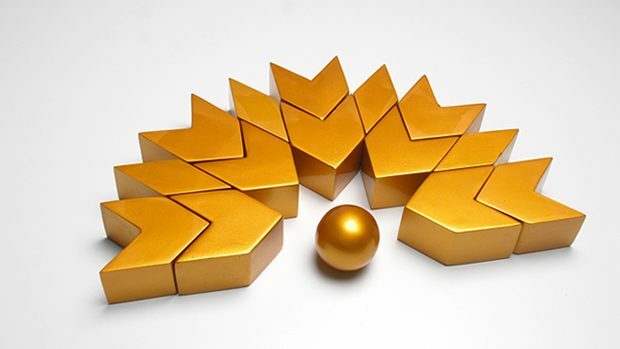 How to manage when the top priorities are different for different stakeholders? It is a delicate balance. Colours can be used to subtly communicate hierarchy of information. Red colour gives date of next visit column visual importance, while it is the first to be seen when one looks at the immunization schedule. But date of immunization is critical too, for healthcare providers and it in hierarchy of information it comes second, hence it was coded blue. To create a visual marker for age of the baby, we added illustration of a new born baby. 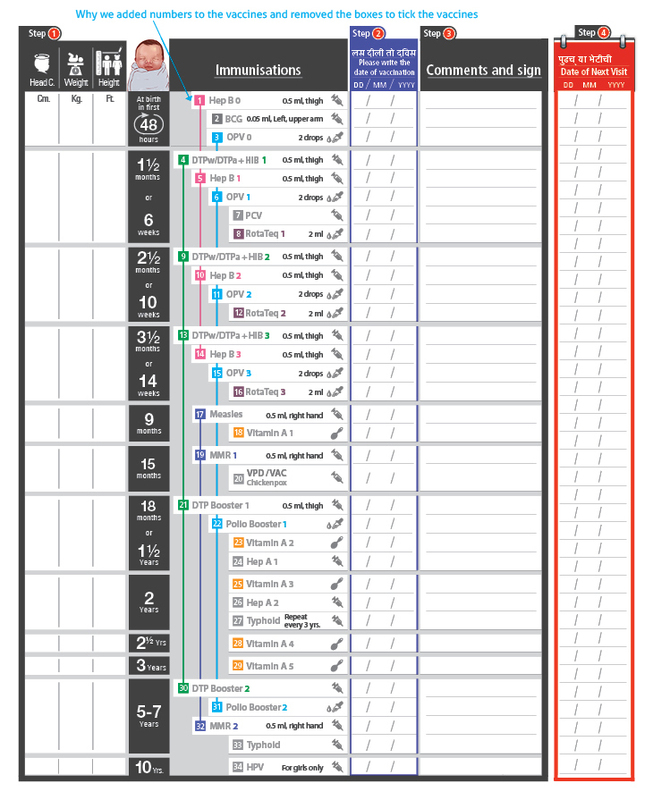 In order to achieve priority number 1 for parents, we separated the column and highlighted it by making it red. (Most important) Also notice that the left chunk of the header that is steps 1 to 3 is meant for healthcare providers while the column on right that is step 4 is meant for parents (although healthcare providers populate it). 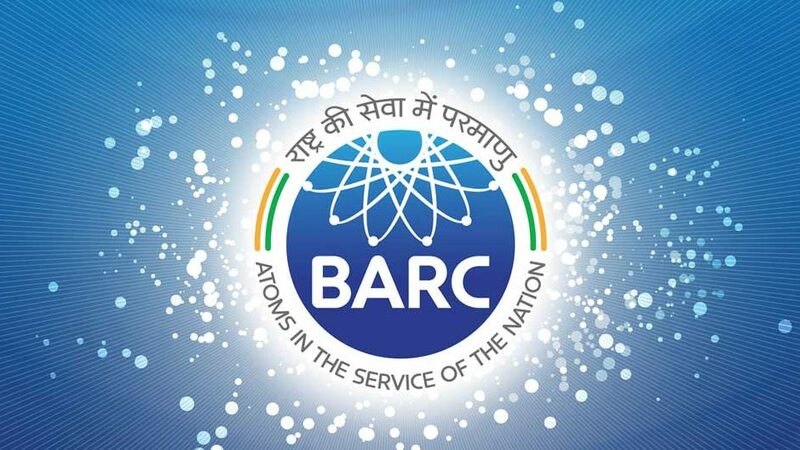 How did we solve the problem of cancellation or revision of date of next visit? To solve the problem of cancellation or revision of date incase immunization is postponed we designed the date of next visit column to flow continuously. Thus it accommodates errors, in case one has to scratch out a date and write again. Connecting lines work even if the colour coding is not visible or if someone is colour blind. Check boxes were added for the healthcare providers to tick after administering each immunization, just to create a redundancy that can confirm which vaccines are given and which were postponed to be administered later. But given the crowds and long queues at a primary health centres, adding another task to the immunization protocol seemed unnecessary and check boxes were done away with. If a card is lost or forgotten at home, semi-literate audiences find it very hard to recall the name of immunization previously administered. But they process numbers far better as numbers are connected to use of money and thereby survival. Hence we utilized the space of checkboxes to add numbers. It is possible to call someone at home and ask for serial number of the immunization last administered or a better chance of recalling in case the card is lost. Maximum vaccines on an A4 vs. vaccines of single visit on single spread approach? We took up the challenge of accommodating all the vaccines currently administered in an Indian PHC in an A4 sheet, so that none of the stakeholders lose an overview of immunisation status. 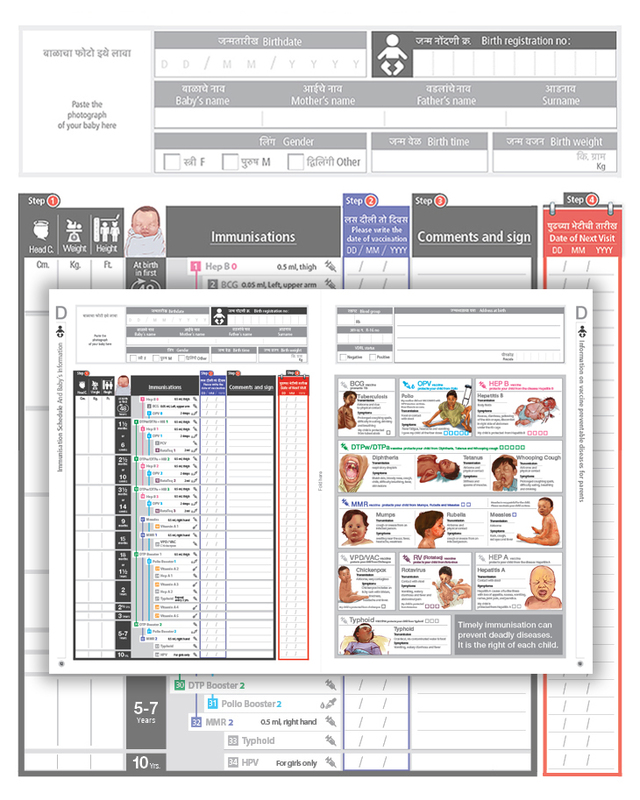 For a quick, at-a-glance overview without turning many pages per immunized child. Benefits surveyors and policymakers who rely on data gathered through immunization card records. Also helps family doctor revisit entire immunization history of a child quickly at a go. 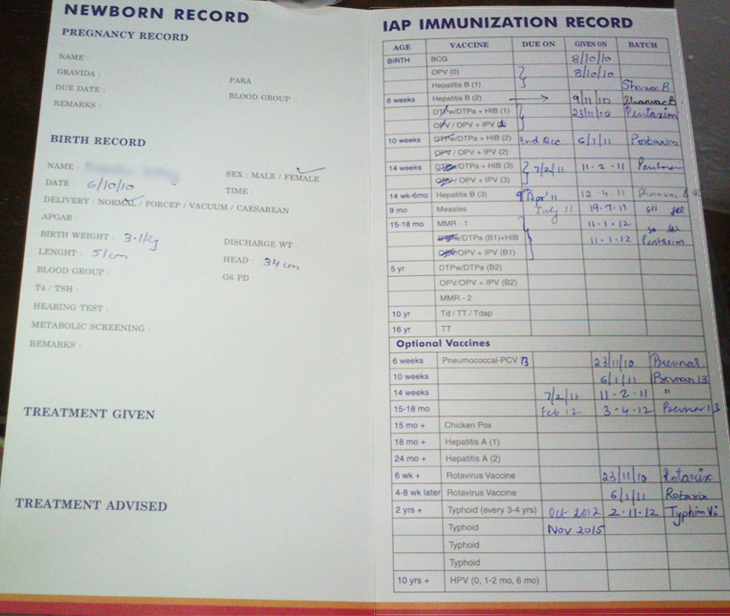 Baby’s information is split onto two pages according to frequency of details accessed at each immunisation visit. Baby’s birth date and registration number, full name and gender are along with immunisation card other details like address at birth, blood group are on adjoining page. In a scenario where electronic health records are common accessing baby’s demographic detail is fairly easy and having baby’s information on immunization schedule may seem like overkill. However in resource poor settings- the immunization card may be the only common source to contain demographic and health information of the baby. Hence these details were retained. 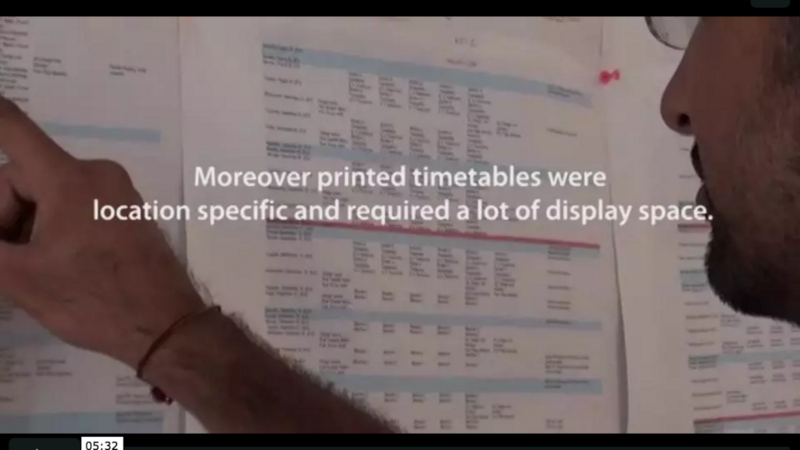 During the contextual inquiry at private clinic, nurses and doctors were found flipping through pages to access baby’s demographic information as it was on a different page than the immunization schedule. Considering that a clinic side copy of immunization details of each child would be maintained in a government PHC or hospital, it makes more sense to have baby’s information in close proximity to the immunization schedule so that the name of the baby and immunization administered can be seen together at a glance along with other details such as head circumference, weight height of the baby and date of next visit. This ensures accuracy and reduces time taken in information input as well as retrieval. Parents will display the Immunisation card because it has their child’s photo, making date of next visit visible. Parents will take better care due to emotional connect. Health Passbook stays protected from oil/ water spills or tearing. It is out of the reach of young children. To parents employed as daily wage workers, earning enough for a day to feed the child may seem like a larger priority than immunizing it against a disease that may strike in future and they may consider skipping immunization. So we added photographs of diseases indicating what would happen if the immunizations are missed. But we changed them to illustrations as photographs were found to be very disturbing, they hindered reading of information. 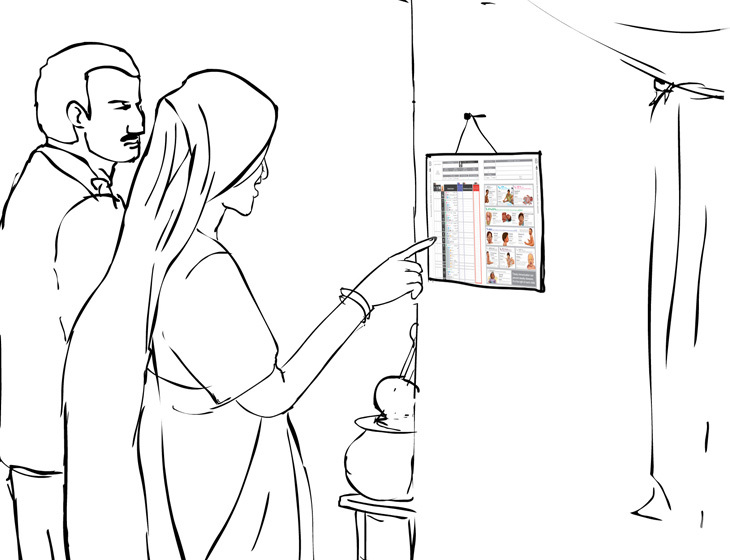 Here the illustrations become an important tool for the health worker to convince the mother regarding importance of immunization. Health worker can communicate to the caregiver significance of each vaccine and on what part of body it will be given, possible reactions arising due to immunisation. Colour-coded check-boxes have been placed in the information blurbs, to give a visual clue of ‘how many doses of this vaccine does my child need to take’. Health workers can encourage parents to check these boxes after immunisation. Colour codes from the immunisation card are continued so that parents can relate vaccine names and diseases prevented, quickly. 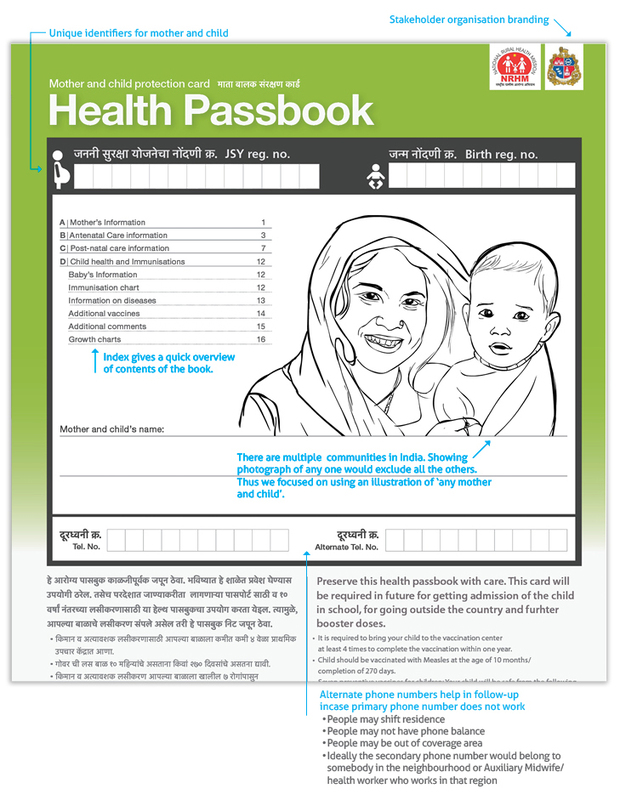 We propose a ‘Health Passbook’ for each mother to keep the health and immunization record of her child. We visualise that the entire medical history of an individual (birth onwards in chronological order) is brought together at one place in this book. Currently we have designed a vaccination only card recording mother and child details and immunisations. We wish to call it the ‘Health Passbook’ to drive home the point that it is as important as the bank passbook and therefore valuable. There is an advantage in visualizing this as a book rather than a standalone immunization card. 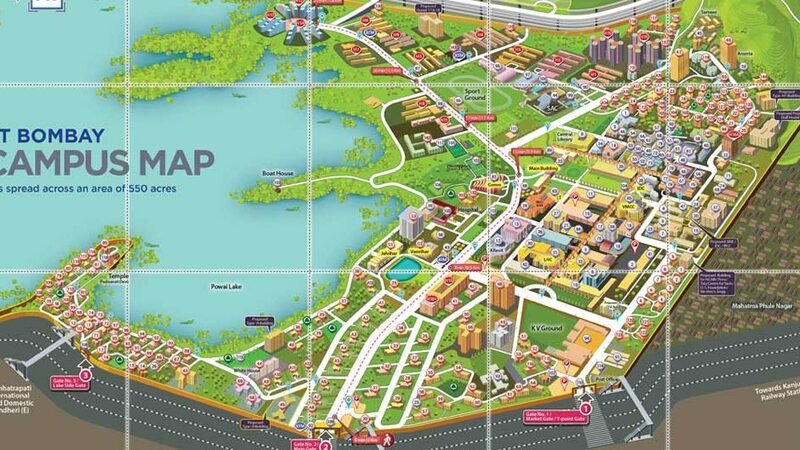 This ‘Health Passbook’ could be standardized across the world. The languages and appearance may differ across countries due to the contextual data. However a cover page constant in its layout can be used to promote significance of immunisation through a worldwide campaign. 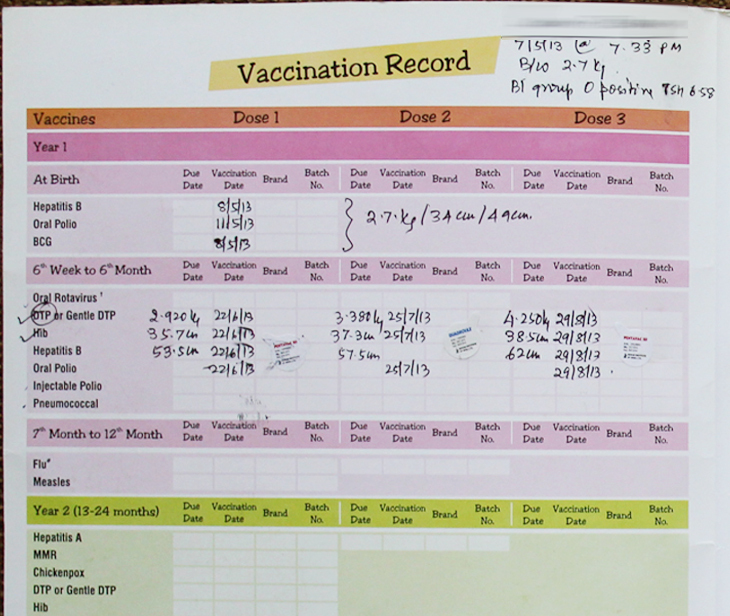 India’s immunization program needed a form to record data. Thus a tabulated form was made; it recorded data and people got by. But with a little empathy things can be much better. Communicating is easy. Effective communication is the challenge. 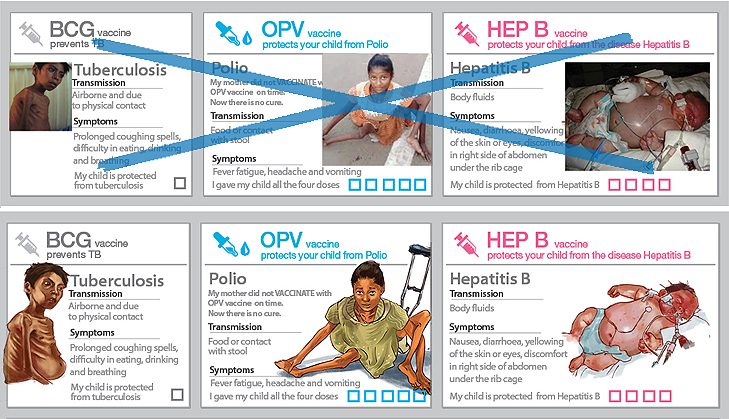 Subtle design changes were employed to improve comprehension of the immunization card. At times they are so subtle in the context of visual design that they need to be told by step by step, concerns that a visual designer employs to find a fine balance to meet the needs of all the stake holders. Therefore the detailed post. Thanks for your time. The post ends.